I like both birch and oak-laminated plywoods. For reference most high quality oak cabinets you see are constructed of oak-laminated plywood but face frames and doors are made from stock oak (which is what cost 3 times as much as your pine sheet). At DIY type stores laminated plywoods are marginally more exspensive than AC plywoods. With the AC plywoods you get what "A" quality side and one "C" quality sides. Are you sure that you compared prices on a square foot level? For me to buy edge-glued pieces of pine that equal a full sheet of plywood the cost is often more. Unless you meant lower grade 1x12's or something like that. The oak and birch laminates are always AA or AB which is good as you want both the interior and exterior to look nice in a herp cage. You could go all out and built real wood frames or you could build the whole thing out of plywood and then apply real-wood edge tape to the exposed cut edges of the plywoods. 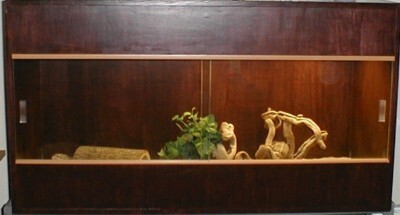 I'll attach a picture of the cage I built for my friends Bearded Dragon. I built the whole thing with a circular saw, a straight edge, and a drill. It is constructed out of birch laminated plywood without a real-wood face frame.